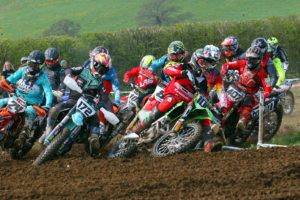 90 Racing MXC were blessed with amazing weather for the opening two rounds of their club championships at the weekend, with the Leisure Lakes track holding up superbly despite the rain leading up to the event. The Autos were out in force, and it was Casey Davey who ruled the roost on Saturday, making up for a 5th in Moto 1 with two wins in the remaining motos to take the round victory from Ricky Barrack in second and race 1 victor Travis Tailford in third. Tailford was on a mission on the Sunday powering to two wins for the overall ahead of Kian Mcgill, who would win race three, and Barrack third. Max Harris was in impeccable form in the Junior 65’s on the Saturday taking a maximum three wins and the overall. Rhys Whyment looked solid all day with second overall, with Finley Pickering third. Kayden Boyd crashed the party on the Sunday, and with a 2-1-4 scorecard, he would take the win over Harris who won two races but suffered from a low scoring ride in Moto 2, which halted his chances of the double round victory. Sonny Rooney rode well for third. Mckenzie Marshall came saw and conquered the Small Wheel 85’s on the Saturday with two moto wins, ahead of Tyla Hooley who would take the first chequered flag of the day. Ryan Waggott kept it consistent with 3 thirds for the number 3 spot. Waggott cleaned up on the Sunday going 1-1-1, with Harley Maskill second and Lewis Proud third. In the Big Wheel 85’s it was Arai Elcock’s weekend as he won both days with a combined total of 4 race wins. Corey Hamilton finished second on each occasion while Ronnie Reeves started the weekend in the best possible fashion with the first win on Saturday, which was a feat he matched on the Sunday. Ronnie is definitely a morning person, and he would finish third overall on Saturday, but down in 10th on Sunday after a disappointing final moto. Cameron Box took the final Sunday podium position with a trio of good rides. The Rookies, as always at 90 Racing were stacked, and it was Lewis Wood who would be the stand out rider in the class. His weekend didn’t get off to the best start with a DNF, but he followed that up with 5 straight victories to take Sunday’s overall. Marshall Smith with a 2-3-2 combination would notch up the Saturday win from Moto 1 victor Aaron Mcloughlin, and Billy Wynn in third. Wynn would rise a place higher on the Sunday to second, with Ben Clark rounding out the top three. Marshall Smith and Harvey Tillotson would both have been podium contenders on the Sunday, but both failed to score in their final motos. Barrie Marshall was the master of the over 30’s on Saturday with a hat-trick of race wins, ahead of Timothy James in second and Chris Hughes in third. It was Ben Lightbown who took the honours on Sunday though with Danny Shiers second, both with a race win apiece with Hughes again third. Mark Kinsey would take the Moto 2 chequers, but a DNF in Moto 3 put him out of victory and podium contention. Results were all over the place in the Novice class on the Saturday, but by winning the third and final moto of the day, it was Joe Buckley who claimed the overall, from Shaun Murphy and Race 1 winner Ryan Kinnear. Harrison Buckley would also claim a race victory in Moto 2, finishing 5th overall. Buckley would be victorious again on the Sunday in a more solid display, again pitching in with a moto win, as did Kinnear who again would finish second on the day with Josh Holden riding consistently in third. Buckley also came good as the day went on, finishing with a flourish and the final moto win for another fifth overall. Liam Crellin was a man on a mission in the Intermediate class on Saturday bashing out a full complement of race wins for the overall. Sverrier Olgeirsson was rock solid with triple 3rd places for second overall, with William Nicholls in third. Olgeirsson was back with a vengeance on Sunday though and unleashed an awesome three wins onto the field for the overall from Ben Southward in second and Austin Mowbray third. The big guns were out in the Expert group and on the Saturday Josh Bentley was a class act, banging in a 1-1-1 scorecard to claim the top spot on the podium. Jack Craggs had an excellent day for second, ahead of Daniel Parry who rounded out the top three. The super talented Rossi Beard showed up on Sunday and showed his potential with a maximum three wins and the overall, from Jake Preston second, Ryan Crowder third, and Bentley completing a superb weekend in fourth. There were a few injuries over the weekend so the club and Dirt Hub would like to wish Jorge Parkin in the 65s, Max Ellerker in the SW85, Corey Collins in the Rookies & Brad Wright in Novices a speedy recovery. Let’s hear it for the girls with 90 Racing MXC!